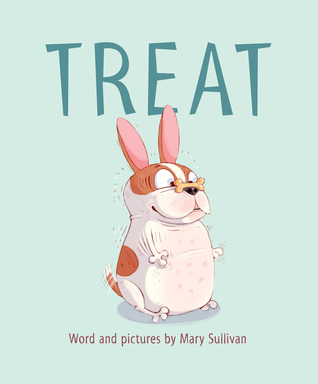 Mary Sullivan's picture book Ball is a favorite of mine, so I was elated to discover she had another one-word story, Treat, and it is just as charming as her first. I especially love that both Ball and Treat say "Word and Pictures by Mary Sullivan." That just makes me giggle every time I see it. As you would imagine, Treat is the story of a highly food-motivated dog who thinks of nothing but where he can find his next snack. As he begs several different members of his family and is teased mercilessly by the family toddler, this French Bulldog walks off dejected and has a series of odd dreams that all revolve around objects he encountered during the day. The big question readers are left wondering as they turn the pages is: will this neglected pooch find something to sate his hunger? To say the dog in this book reminds me of my pug Frank would be an understatement. He has spent his entire life trying to think of ways to acquire his next meal or snack. And if he's not looking for a snack, he's looking for a lap. So I think I'm definitely going to have to own this book.